DublinTown and the Dublin Chamber of Commerce have both issued statements of support for the pedestrian and cycling plaza planned for College Green. DublinTown is the main group representing Dublin city centre businesses, while Dublin Chamber of Commerce covers a wider area of Dublin, while including businesses in and around the city centre. The support from business follows cross-party support from local councillors on Monday when the plan was made public. He added: “We look forward to the development of the civic plaza on College Green and the creation of a central event space. These are exciting times when we are future proofing the city for 21st century. Dublin has the clear potential to be a key European city and the decisions we make today will determine our success for the decades to come. The inclusive process adopted in the development of the current proposals auger well for the future. 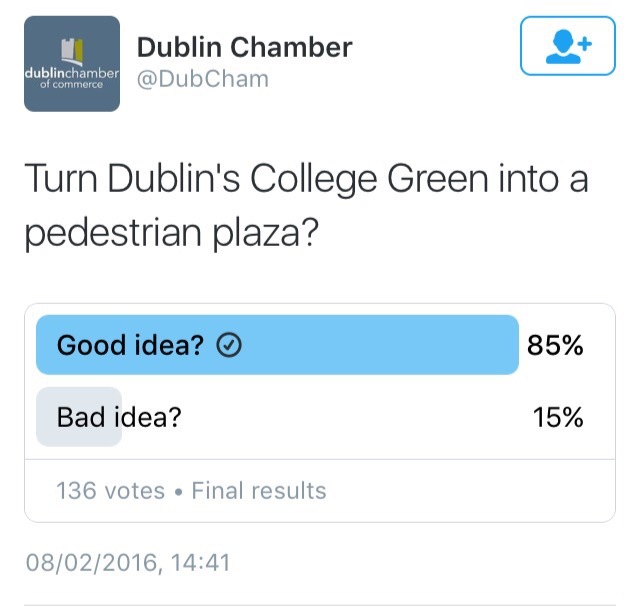 The Dublin Chamber of Commerce, also ran a Twitter poll, which resulted in a small sample but found that 85% of followers who responded support the idea with a “Good idea?” response, while only 15% chose “Bad idea?”. A third business group, the Dublin City Business Association, which is a more fringe group with a record of objecting to public transport improvements, said at the city council transport committee on Wednesday morning that it had concerns about tourist coach access and access to car parks, but city council officals make it clear that such was provided for, and representatives of other business groups welcomed this. While stating concerns, the Dublin City Business Association representative did not clearly object to the plans for the plaza. UPDATED: This article was updated on February 10, 2016, to add in the views of Dublin Chamber of Commerce and the Dublin City Business Association.